The MPU6050-Breakout board is a small integrated 6-axis motion tracking device that combines 3-axis accelerometer and 3-axis gyroscope. MPU6050 is a very advanced chip which has an inbuilt accelerometer, a gyro and a temperature sensor; also the chip can control external magnetometer and other sensors. The onboard Digital Motion Processor™(DMP™) capable of processing complex 9-axis Motion Fusion algorithms. This helps to eliminate many problems related with motion processing such as cross-axis alignment intensive Motion Processing computation requirements from the system processor. This minimizes the need for frequent polling of the motion sensor output. MPU-6050 Motion Processing Unit is the world’s first motion processing solution with integrated 9-Axis sensor fusion using its field-proven and proprietary Motion Fusion™ engine for handset and tablet applications, game controllers, motion pointer remote controls, and other consumer devices. 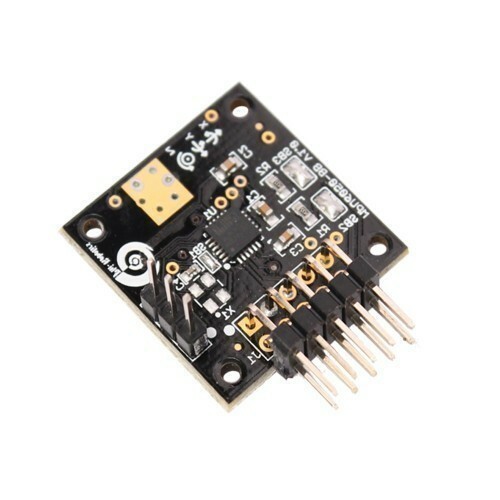 When connected to a 3-axis magnetometer, the MPU-6050 delivers a complete 9-axis Motion Fusion output to its primary I2C. TheMPU-6050 combines acceleration and rotational motion plus heading information into a single data stream for the application.The MPU6050 supports I2C communications at up to 400 kHz.